Saint Mungo is the commonly used name for Saint Kentigern (also known as Cantigernus (Latin) or Cyndeyrn Garthwys (Welsh)). 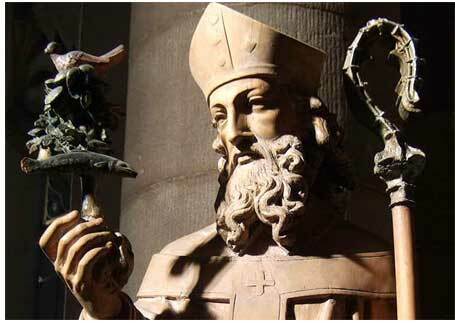 He was the late 6th century apostle of the Brythonic Kingdom of Strathclyde in modern Scotland, and patron saint and founder of the city of Glasgow. Mungo's mother, Thenaw, was the daughter of the Brythonic king, Lleuddun (Latin, Leudonus), who ruled in the Haddington region of what is now Scotland, probably the Kingdom of Gododdin in the Old North. She fell pregnant, after being seduced by Owain mab Urien according to the British Library manuscript. Her furious father had her thrown from heights of Traprain Law. Surviving, she was then abandoned in a coracle in which she drifted across the River Forth to Culross in Fife. There Mungo was born. Mungo was brought up by Saint Serf who was ministering to the Picts in that area. It was Serf who gave him his popular pet-name. At the age of twenty-five, Mungo began his missionary labors on the Clyde, on the site of modern Glasgow. Christianity had been introduced to the region by Saint Ninian and his followers welcomed the saint and procured his consecration by an Irish bishop. He built his church at the confluence of the Clyde and the Molendinar Burn, where the present medieval cathedral now stands. For some thirteen years, he labored in the district, living a most austere life in a small cell and making many converts by his holy example and his preaching. In the fictional world of Harry Potter, Saint Mungo is the patron of St Mungo's Hospital for Magical Maladies and Injuries. · The Bird — Mungo restored life to the pet robin of Saint Serf, which had been killed by some of his fellow classmates, hoping to blame him for its death. · The Tree — Mungo had been left in charge of a fire in Saint Serf's monastery. He fell asleep and the fire went out. Taking branches from a tree, he restarted the fire. · The Bell — the bell is thought to have been brought by Mungo from Rome. It was said to have been used in services and to mourn the deceased. The original bell no longer exists, and a replacement, created in the 1640s, is now on display in Glasgow.